Outdoor folding armchair with hard wearing Robina teak slats. Folds easily for convenient storage. See below for details on matching tables and side chairs. In stock for a free and fast UK delivery within 5 working days. 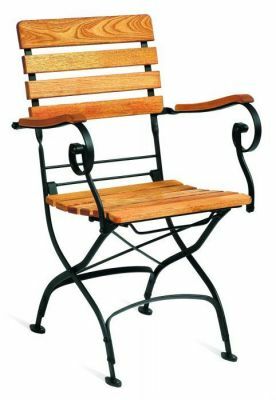 Classically designed outdoor wooden arm chair with a folding mechanism. Includes a black finish steel frame with feature arms, extra support bars and feature arms. Perfect for outdoor use in a sophisticated commercial space.